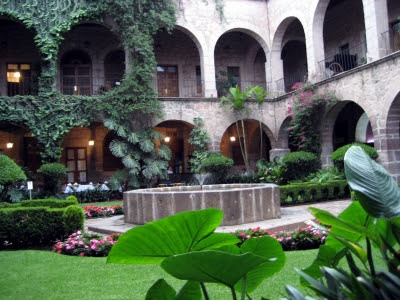 The Loops 2007 this year was held at the University in Morelia, Mexico, in a very nice building (see also Stefan's previous post). The auditorium had a stage with the speaker being in the spotlight, the seats were very comfortable to doze off, and the hallways had very picturesque pillars and arches (see photo to the left). My head is still spinning a bit, trying to process all the information gathered here (well, it might also be the lack of oxygen in the air, it is rather polluted and the high altitude doesn't help either). It's been my first conference in this community, and I have to say from all the conferences where I've been this year, the Loops has been the nicest experience. The atmosphere has been very welcoming, openminded and constructive. My talk yesterday on 'Phenomenological Quantum Gravity' (slides here) went well (that is to say, I stayed roughly in the time limit and didn't make any completely embarrasing jokes). Though I wasn't really aware that I would be the only one on this conference speaking about DSR. If I had known, I might have extended my summary of that topic (there was a DSR talk scheduled by Florian Girelli, see picture to the right, but he changed the topic shortly, which I didn't know). Because it's just such a nice experience to arrive in a foreign city where nobody understands your language, without any baggage, after a 36 hour trip, with an 8 hour jetlag, having just figured out that the credit card doesn't work, and the hotel doesn't have a reservation for you - and then to find the conference site with familiar faces, the air filled with words like 'propagator', 'manifold' and 'background independence'. Because one meets old and new friends, because there's a conference dinner or reception, and plenty of free coffee and cookies. Because some people present new and so far unpublished results. Admittedly, I found the phenomenlogical part on this conference somewhat underrepresented. Indeed, I found myself joking I am the phenomenology of the conference! 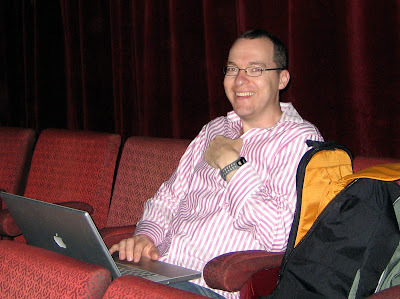 Likewise, Moshe Rozali (who you might also know from comments on this blog) has been the String Theory of the conference. He gave a very interesting talk about the meaning of background independence. This afternoon, I am chilling out (okay, actually I am writing referee reports that have been due about a month ago). 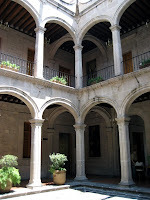 Below a picture of the hotel's inner yard where I am sitting (taken yesterday, right now it is raining). Tomorrow I am flying back to Canada, and I am really looking forward to sleeping in my own bed. A nice weekend to all of you! Updates: Chanda just sent me a photo she took yesterday evening. 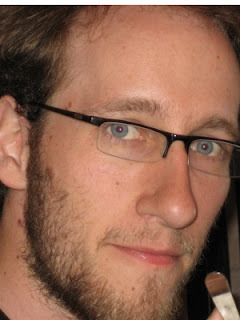 I am very pleased about the truly intellectual expression on my face, must be the glasses. And Garrett took this nice photo. I have to admit that it took some time until I understood the idea of the "Philosophia Naturalis Blog Carnival", even more so as the actual blog just contains links to posts at different other blogs. 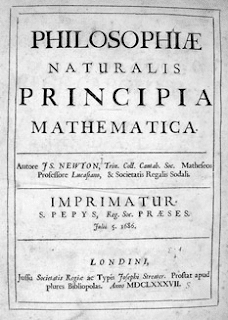 This idea of these "philosophia naturalis" contributions, hosted by a different blog every month, is to publish a collection of interesting posts on topics in the physical sciences that have appeared over the last month. Thus, they provide a selection of noteworthy reading out there, and help to give you an overview over interesting blogs dealing with physics and related topics. 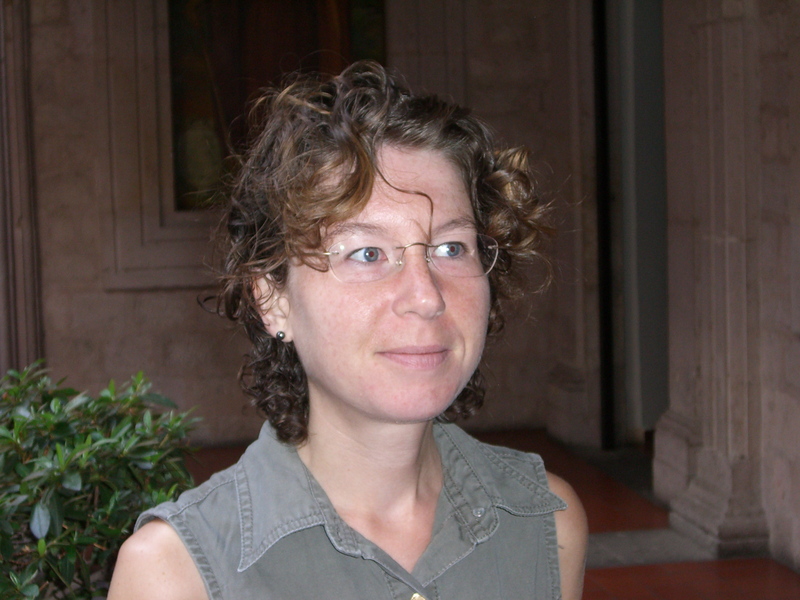 This month's Philosophia Naturalis #11 is hosted by geologist Chris Rowan at Highly Allochthonous, and I am very proud to see this blog represented by both its contributors - with Bee on Kaluza-Klein, and myself about the Bouncing Neutrons! It's such a faint and blurred blob even in the Hubble Space Telescope because it is quite small, and far away from Earth: At the moment, Eris is close to its aphelion, at a distance of 97 astronomical units - that's 97 times the mean distance of the Earth from the Sun! You can explore its eccentric and highly inclined orbit with this applet from the JPL. In fact, according to the new definition of the International Astronomical Union from last August, Eris is not a planet, but only a dwarf planet. However, it is larger than Pluto, and it has more mass than Pluto, as was reported in a beautiful short note in Science two weeks ago [Ref 5]! So, for all those who prefer to stick to the old definition of a planet, it may be the true ninth planet - unless some other, even larger guy shows up from out there in the Kuiper belt. 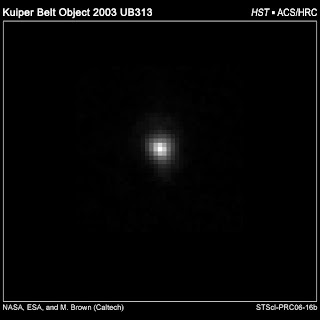 Eris was discovered in October 2003 by astronomers Michael Brown, Chad Trujillo, and David Rabinowitz [Ref 1]. It was given the provisional name 2003 UB313, or Xena for short. Soon after the discovery, its size could be measured by observations with a radio telescope of the Max-Planck Society [Ref 2] and the Hubble Space Telescope [Ref 3], and it came out that the new planet is larger than Pluto! Moreover, there is a small moon in orbit around Eris, which was given the nickname Gabrielle. On September 14, 2006 the International Astronomical Union made official the names Eris for the planet and Dysnomia for its satellite. The discovery of Eris, and of several other large objects in orbits beyond Neptune, had spurred the hot debate about what is a planet, which then lead to the degradation of Pluto from planet to "dwarf planet" in August 2006. So it is fitting that Eris is the Greek goddess of strife and discord - Dysnomia, her daughter, is the goddess of lawlessness. But in a time when ancient Greek gods and goddesses are reduced to large balls of rock and gas in space, even the goddess of lawlessness is subject to Newton's universal law of gravitational attraction. And this allows, in an elementary and elegant, classical way, to determine the mass of Eris. 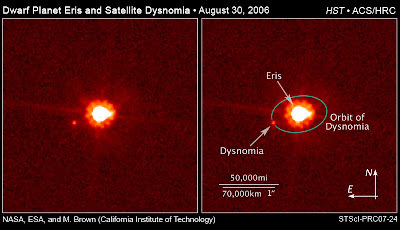 In a first step, the orbit of Dysnomia around Eris has been determined from several observations with the Hubble Space Telescope and the Keck telescope in Hawaii. 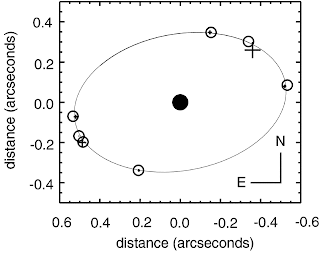 The observation of Dysnomia as shown in this figure reveals an apparent diameter of the orbit of roughly 1.1 arcsec, which, at the distance of 97 Astronomical units, or 97 × 150 million km ≈ 1.46·1010 km, corresponds to a diameter of 1.46·1010 × 1.1 × 2π / (360 × 3600) km ≈ 78000 km. A more detailed analysis yields an indeed circular orbit with a semimajor axis of r = 37500±200 km. Now, this can be used to deduce the mass ME of Eris! 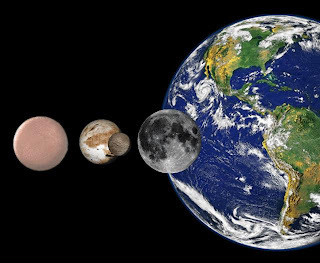 For comparison, Pluto has a mass of 1.3·1022 kg, the Moon of 7.35·1022 kg, and the Earth of 5.97·1024 kg. This means, the masses of Eris, Pluto, the Moon, and the Earth compare as 1.3 : 1 : 5.6 : 459. And so, indeed, Eris and Pluto are on equal footing, revealed by the goddess of lawlessness and Newton's law! 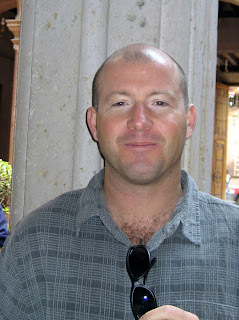 The conference Loops'07 takes place this week in Morelia, Mexico. 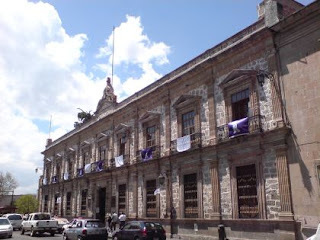 The Colegio de San Nicolás in Morelia, where the Loops'07 takes place this week. Well, I can't tell you much more than what you can read on the web page. Bee could, as she has just arrived there, after a neat 36 hour trip (I guess she has wasted at least one week sitting around in airports and train stations over the last month or so...). But there seems to be no stable Internet connection at the conference venue, or at the hotel where she stays. Morelia is a charming city, though quite noisy, and it's hard to get around with my Spanish skills or rather absense thereof (my Spanish is even worse than my Italian and Polish). The trip (air france, Frankfurt-Paris-Mexico City-Morelia) was somewhat annoying. My-stupid-bag remained in Paris, the transatlantic flight was delayed and so I missed the onward flight. Since it turned out to have been the last flight to Morelia that evening I had to spend a very mediocre night in Mexico City, and arrived in Morelia yesterday morning just in time for the first talk. (The hotel people then insisted I had no reservation, and my bag still hasn't reappeared - so much about the joys of travelling). The conference is very interesting so far. It is my first time at the Loops and since I'm new in the community I'm somewhat nervous about my talk on Friday. 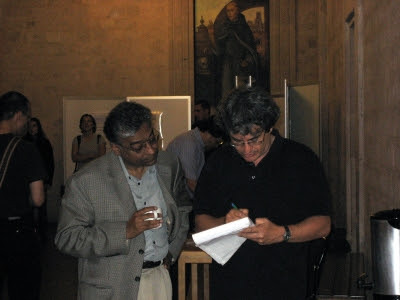 The topics are very diverse, ranging from foundations of quantum mechanics over loop quantum gravity to semiclassical quantum field theory in curved backgrounds etc. The Strings 07 is also this week in Madrid, so its unsurprising that there isn't much stringy stuff around here (e.g. I haven't seen any ducks, just chickens). Being the phenomenologist I of course find the phenomenology somewhat underrepresented - the Trieste workshop was much better balanced for my interests. My name-tag says International Conference on Quantum Gravity and I can't avoid but think this is what I've always wanted to work on, and that I am very happy to be part of it - baggage or no baggage. These days I came by chance across some older issues of the Scientific American, out of a collection Bee had inherited some time ago from a former science professor. I find it always fascinating to browse through old, yellowed magazines. We can see what kept busy the minds of people at that time, and witness now well-established knowledge in the making. The oldest number in the collection is the issue of October 1960, and the feature articles form a mix that is very similar to what we could find in the magazine today: Archaeology ("A Forgotten Civilization - Bahrein Island in the Persian gulf was a link between Sumer and ancient India"), Biology ("Electric Fishes - Not only the electric eel but also other fishes can generate a respectable charge"; "The Eradication of the Screw-worm Fly - A serious pest of cattle has been combatted by sterilizing its males with X-rays"), Geology ("The Rift in the Ocean Floor - The great ridge that bisects most of the oceans is split by a remarkable fissure"), History of Science ("Count Rumford - Born Benjamin Thompson in Massachusetts, he was a great investigator of heat"), and Physics ("Optical Pumping - Light is used to pump electrons to higher energies for spectroscopic purposes"; "The Physics of Wood Winds - Modern physics makes possible a closer analysis of how these instruments work"; "High-Speed Impact - Bodies collecting at speeds higher than 8000 feet per second behave like fluids"). 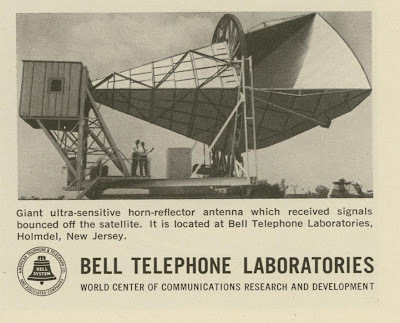 Are you also puzzled by that funny-shaped antenna displayed in the ads of the JPL and Bell Labs? But yeah - that is the antenna which came to true scientific fame three years later, when Penzias and Wilson recognised that it was constantly registering some funny, isotropic microwave noise corresponding to a temperature of 3 Kelvin - the Cosmic Microwave Background! What I just read in the newspaper, I thought it might amuse you. Mumbai, India, June 17th 2007: Pradeep Hode, a 30 year-old from Diva in Thane, chronic patient of tuberculosis had to undergo an emergency surgery on Friday morning during which 117 coins where removed from his stomach. Based on hearsay and some bizarre logic of his own, the man started swallowing coins, hoping that the heavy metal would cure him. Taking the plane is usually a fast, and often a quite convenient way of travelling. But sometimes, thunderstorms interfere with the flight plan, and then it can happen that all flights but one from Munich to Frankfurt are cancelled. And if you have bad luck, you are sitting at the airport and wait and wait ... only to hear that you have either to spend the night there, or take a train, which, if you would have done that earlier, you have brought to your destination already since hours... That's what has happened to Bee yesterday - and that's why I'll meet her now this morning at the train station, instead of the airport yesterday evening. Thanks to Akin Wingerter for the photo - and I am off for the train station. "better get used to staying up all night" - yo, man. I meant to tell you something about the String Pheno, but the slides are still not online. So, instead just a lovely photo from the old part of the village, Frascati, where it took place. I am on my way back to Italy, this time to Trieste where I will attend the workshop From Quantum to Emergent Gravity: Theory and Phenomenology. You see, we are in good company :-) I am very flattered by such honor and find the text remarkably accurate (well, I didn't know how to spell 'Landolt-Börnstein'). The mentioned Aero chocolate is here, and the 'humorous take on the recent debate over the status of string theory' is here. The 'lengthy and thoughtful posts' as well as the inpiration series you find in the sidebar. Can you spot a fake smile? Take the test. 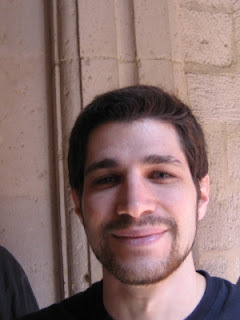 "Scientists distinguish between genuine and fake smiles by using a coding system called the Facial Action Coding System (FACS), which was devised by Professor Paul Ekman of the University of California and Dr Wallace V. Friesen of the University of Kentucky." 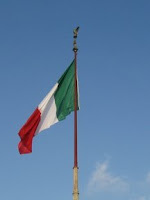 Seen somewhere in Rome around here, close by the Piazza del Quirinale. Still think you like buildings where you can feel the presence of the ancestors? 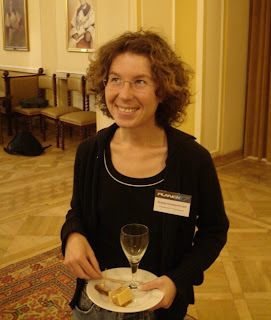 And here I am in Warsaw for the next conference, the Planck 2007. I am very happy to report that this time my-stupid-bag arrived with me. However, at the airport I noticed that I managed to book what I thought was a hotel without having a street address. It took me some back and forth to find it out (since my Polish is even worse than my Italian). The taxi driver dropped me off and pointed vaguely into a direction since the address turned out to be in a pedestrian-only zone. After pulling my-stupid-bag through several cobblestone roads, I found the house. There I was explained that it's not an hotel at all. They rent apartments in 'the old town', and mine would actually be in another building, and also, would I please pay in advance, preferably in cash. I probably didn't exactly contribute to Germany's good reputation by simply refusing to pay anything before I had seen the apartment. However, I shouldn't have worried. The apartment is great, larger than mine at home, has a living room as well as a completely equipped kitchen including washing machine and dishwasher. And is less expensive than every hotel I could find in this area (I was pretty late with booking). The only drawback is the absence of any internet connection. (The reason being 'there are mostly older ladies staying with us'). Right now, I am sitting on a bench in the middle of Warsaw's old town blogging over an open access wireless that has a pretty good bandwidth. There is a small fountain in the middle and the place is surrounded by lovely colorful old houses, most of which have restaurants. Lots of people are sitting here, chatting, having dinner, drinking beer. Pigeons are hopping around, children are playing with the water in the fountain. A guy behind me just started playing the violin, its incredibly bad. Oh no! I recognize that song 'Und wenn wir alle Englein wären....'. I just love to sit an watch people. Meanwhile it has gotten dark and next to the fountain is a women juggling with torches. Unfortunately, I can see lots of clouds in the north and it looks like rain. Plus, there are plenty of mosquitoes, and the accordion isn't convincing either. So I'll pack my laptop and try to get some sleep to be fit for all the physicists tomorrow. PS: Ach, und könnt mir vielleicht jemand sagen was 'Wo bitte bekomme ich Damenbinden?' auf Polnisch heisst und wie ich das ausspreche? 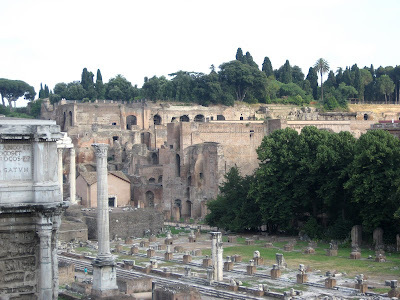 On the weekend, I flew to Rome to addend the String Pheno 2007. Meanwhile, my baggage decided to have a vacation in Palermo. It arrived with four days delay yesterday evening. I've been wearing the same clothes since the weekend, but this morning I saw myself faced with an incredible selection! A second jeans! Two T-shirts! A dress! However, despite these inconveniences, I had a so far very pleasant stay since it turned out that Amara Graps (you might know her from the blogosphere) lives nearby. 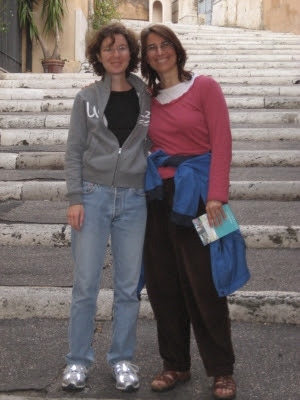 She was so kind to borrow me some clothes, and yesterday we spent a very nice afternoon in Rome. Since I am currently sitting in mentioned conference (and should at least pretend to listen) let me instead show you a photo. It will take approximately 20 minutes, and has plenty of comment options to complain about the new arXiv listing (or the eternal bug in the search field if you search for a tag containing the word 'not'). Other points that I find worth mentioning: the arxiv should allow comments on papers, and a ranking (different from times cited). Comments would be helpful to avoid the increasing amount of 'reply-to-reply-to-reply-to's, ranking I would find a good idea because it's become almost impossible to find a good review or lecture notes if one doesn't know the author (and lecture notes don't usually become top-cites). A somewhat belated 'Hello' from Germany! Sure sure, America is still faster, bigger, better: Germany still doesn't have penny trays (I consider that to be one of the most important advantages of the USA), they still don't know what 'cash back' is, and shops are still closed when I finally find the time to go there. Something completely different: since all-my-mother's-children have moved out and the cat died, the house gets populated by an ever increasing amount of handmade Teddy bears. I remember a moment of excitement and puzzlement early on in my first class in quantum mechanics, when our professor announced that now, he would discuss the "freier Fall" in quantum mechanics. I was excited, because it seemed great to me to transfer such an elementary situation as the free fall of a stone into the realm of quantum mechanics, and puzzled, because I knew that the gravitational potential is so extremely weak that it can be safely ignored on scales where quantum mechanics comes into play - at least, in most cases. Alas, that lecture was quite a disappointment, because of an ambiguity of the German wording "freier Fall": it can mean both the free "fall", and the free "case" (as in Wittgenstein's famous dictum "Die Welt ist alles, was der Fall ist.") - and what we learned in our lecture was just about the free case, the quite boring plane wave motion of a quantum particle subject to no potential whatsoever. What we did not learn in our class was that, even back at that time, there had been several clever experiments with neutrons which demonstrate the influence of the gravitational potential on the phase of the neutron wave function using interferometers. Neutrons, of course, are ideal particles to perform such experiments, since they have no electric charge and are not subject to the influence of the ubiquitous electromagnetic fields. 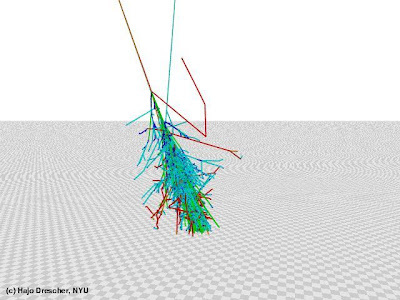 But only over the last few years, new experiments have been realised that show directly the quantisation of the vertical "free fall" motion of neutrons in the gravitational field of the Earth. I had heard about them some time ago in connection with their possible role for the detection of Non-Newtonian forces, or the modifications of Newtonian gravity at short distances. 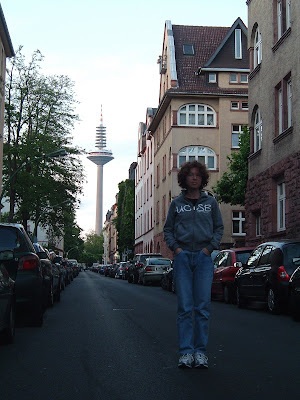 Then, earlier this year, I heard a talk by one of the experimenters at Frankfurt University, and I was quote fascinated when I followed the papers describing the experiments. In order to better understand the experiment, let's go back one step and consider the very simple motion of an elastic ball which is dropped on the ground. If the ground is plane and reflecting, and the ball is ideally elastic such that there is no dissipation of energy, the ball will jump back to the height of where it was dropped from, fall down again, jump back, fall, and so on. The height of the ball over ground as a function of time is shown as the blue curve in the left of this figure: it is simply a sequence of nice parabolas. We can now ask, What is the probability to find the bouncing ball in a certain height above the floor? For example, we could make a movie of the bouncing ball, take a still at some random time, and check the distribution of the height of the ball if we repeat this for many random stills. The result of this random sampling of the bouncing motion of the ball is the probability distribution shown in red on the right-hand side of figure. The probability to find the ball at a certain height in this idealised, "stationary" situation, where the elastic ball is bouncing forever, is highest at the upper turning point of the motion, and lowest at the bottom, where the ball is reflected. The wave function, shown on the left in magenta, oscillates through two nodes, and goes down to zero exponentially above the classical limiting height, which corresponds to the upper turning point of the parabola of a classical particle with the same energy. For neutrons in this state, this height is 32.4 µm above the plane. The green curve on the right shows the probability density corresponding to the wave function. It is quite different from the classical probability density, shown in red. As a characteristical property of a quantum system, there is, besides the two nodes, a certain probability to find the particle above the classical turning point. This is an example of the tunnel effect: there is a chance to find a quantum particle in regions where by the laws of classical physics, it would not be allowed to be because of unsufficient energy. However, going from the ground state to ever higher excited states eventually reproduces the probability distribtion of classical physics. This is what is called the correspondence principle, and you can see what it means if you have a look at the wave function for 60th excited state: Here, the probability distribution derived from the quantum wave function follows already very closely the classical distribution. So far, we have been talking about theory: the Schrödinger equation and its solutions in guise of the Airy function. There is no reason at all to doubt the validity of the Schrödinger equation: it has been thoroughly tested in innumerable situations, from the hydrogen atom to solid state physics. However, in all these situations, the interaction of the particles involved is electromagnetic, and not by gravitation. For this reason, it is extremely interesting to think about ways to check the solution of the Schrödinger equation for particles in the gravitational field. As we have seen before, the best way to do this is to work with neutrons, in order to avoid spurious electromagnetic effects. Adapted by permission from Macmillan Publishers Ltd: Nature (doi:10.1038/415297a), copyright 2002. This has been the first verification of quantised states of particles in the gravitational field! 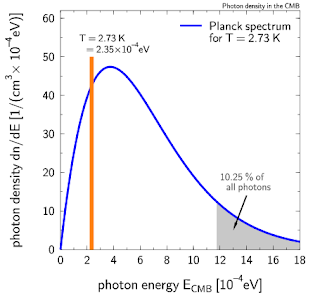 You may wonder if the experiment may not have shown just some "particle in a box" quantisation, since the channel for the neutrons formed by the reflecting plane and the absorber may make up such a box. This objection has been raised, indeed, in a comment paper, and has been answered by detailed calculations, and improved experiments: the conclusion about quantisation in the gravitational field remains fully valid! However, limits about modifications of Newtonian gravity from this experiment remain restricted. Such a modification would change the potential the neutrons are moving in. For example, a short-range force caused by the matter of reflecting plane could contribute to the potential of the neutrons. However, as comes out, such an additional potential would be very weak and have nearly no influence at all on the overall wave function of the neutron. But all these restrictions do not change at all the main point that this a very exciting, elementary experiment, which could find its way into textbooks of quantum mechanics! Quantum states of neutrons in the Earth's gravitational field by V.V. Nesvizhevsky, H.G. Boerner, A.K. Petoukhov, H. Abele, S. Baessler, F. Ruess, Th. Stoeferle, A. Westphal, A.M. Gagarski, G.A. 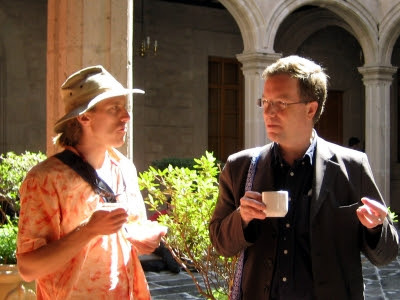 Petrov, and A.V. Strelkov; Nature 415 (2002) 297-299 (doi: 10.1038/415297a) - The first description of the result. Measurement of quantum states of neutrons in the Earth's gravitational field by V.V. Nesvizhevsky, H.G. Boerner, A.M. Gagarsky, A.K. Petoukhov, G.A. Petrov, H.Abele, S. Baessler, G. Divkovic, F.J. Ruess, Th. Stoeferle, A. Westphal, A.V. Strelkov, K.V. Protasov, A.Yu. Voronin; Phys.Rev. D 67 (2003) 102002 (doi: 10.1103/PhysRevD.67.102002 | arXiv: hep-ph/0306198v1) - A more detailed description of the experimental setup and the first results. Study of the neutron quantum states in the gravity field by V.V. Nesvizhevsky, A.K. Petukhov, H.G. Boerner, T.A. Baranova, A.M. Gagarski, G.A. 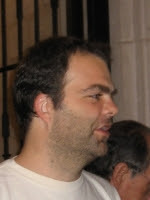 Petrov, K.V. Protasov, A.Yu. Voronin, S. Baessler, H. Abele, A. Westphal, L. Lucovac; Eur.Phys.J. C 40 (2005) 479-491 (doi: 10.1140/epjc/s2005-02135-y | arXiv: hep-ph/0502081v2) - Another more detailed discussion of the experimental setup, possible sources of error, and the first results. 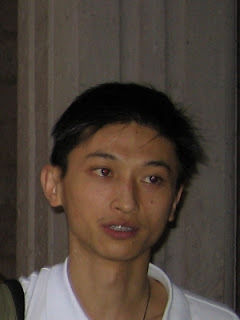 Quantum motion of a neutron in a wave-guide in the gravitational field by A.Yu. Voronin, H. Abele, S. Baessler, V.V. Nesvizhevsky, A.K. Petukhov, K.V. Protasov, A. Westphal; Phys.Rev. D 73 (2006) 044029 (doi: 10.1103/PhysRevD.73.044029 | arXiv: quant-ph/0512129v2) - A long and detailed discussion of point such as the "particle in the box" ambiguity and the role of the absorber. Constrains on non-Newtonian gravity from the experiment on neutron quantum states in the Earth's gravitational field by V.V. Nesvizhevsky, K.V. Protasov; Class.Quant.Grav. 21 (2004) 4557-4566 (doi: 10.1088/0264-9381/21/19/005 | arXiv: hep-ph/0401179v1) - As the title says: a discussion of the constraints for Non-Newtonian forces. 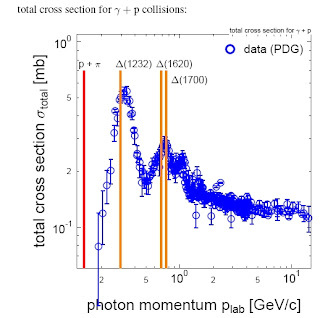 Spontaneous emission of graviton by a quantum bouncer by G. Pignol, K.V. Protasov, V.V. Nesvizhevsky; Class.Quant.Grav. 24 (2007) 2439-2441 (doi: 10.1088/0264-9381/24/9/N02 | arXiv: quant-ph/07702256v1) - As the title suggests: the estimate for the emission of a graviton from the neutron in the gravitational field.